Here's some great news out of Toronto: physically separated bike lanes on Sherbourne with bright, visible green lanes and bike boxes at intersections. 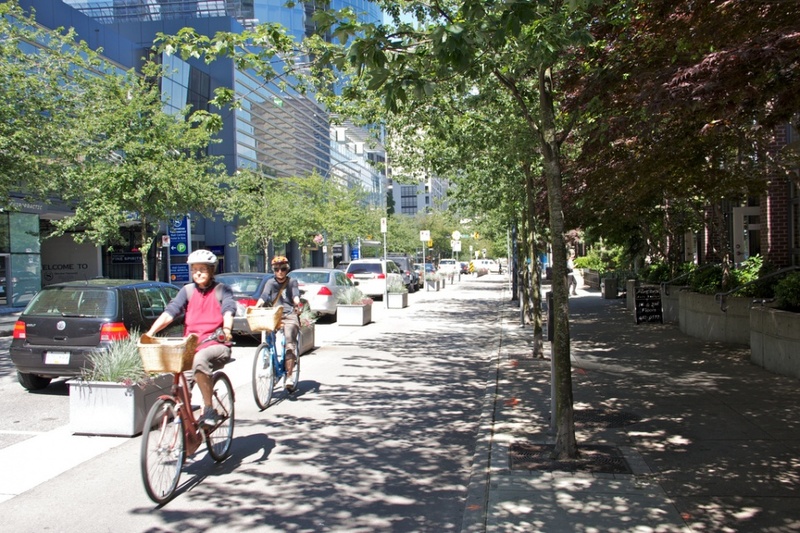 Toronto follows on the heels of Ottawa, which recently opened a separated lane on Laurier Avenue with more to come, as well as bold, green lanes and bike boxes. It's great to see Ontario cities finally catching up to the North American leaders on this vital infrastructure. Seeing this design makes a lot of sense, with raised curbs to separate cyclists from drivers and the green painted lanes through intersections. One word of caution already coming out of Toronto this week since these lanes opened: the rounded curb edge is allowing drivers to feel comfortable about hopping over and blocking the lanes. Ottawa has a bicycle traffic counter on Laurier Avenue, which carries on average around 2,000 cyclists a weekday from the months of May through October (or 1,171 cyclists a weekday averaged year-round). Keesmaat wrote, "you can't drive over them + they are not over-engineered. True separation." I know we are planning separated lanes on Hunter Street. 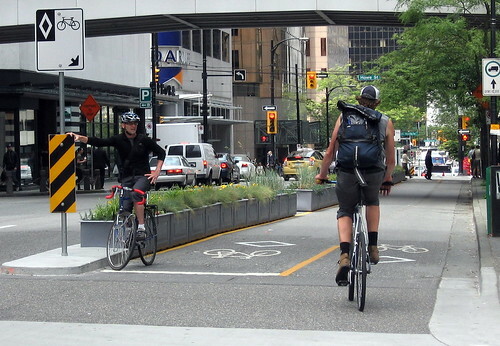 This is the chance for us to learn from other cities and use the best ideas, including real barriers cars can't cross, affordable planter boxes and painted bike boxes like other cities are using. City of Hamilton/Downtown Hamilton BIA's inability to keep sun-scorched planters across the core from being repurposed into garbage bins/ashtrays. These lanes at Sherbourne are nice, but yes, every time I ride on them I encounter at least one vehicle parked on the bike lane - usually a delivery truck. Luckily, since the street is designed to keep traffic slow and calm, it is not difficult to merge into the roadway and pass them - this would not work on a roadway that had more than two lanes or was easy to speed on. There's no doubt that these are progress, and have been well maintained in winter, but it's like putting in a granite counter top to please the missus when the roof is leaking and the kids need new shoes: oh soo soo much more needs to be done to create new bike lanes in a linked, smooth, safe network in the core, but the push is to get headlines and cite millions vs. give safe, wider mobility for bikes in the core. I was protesting there urging bike lanes on Bloor with mere paint at $25,000 a km vs. whatever Sherbourne is/was. Also, green bike boxes, green turning boxes and bike traffic signals.